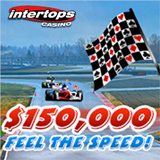 Every Monday during the $150,000 Feel the Speed casino bonus race, all Intertops Casino players have a chance to win a casino bonus up to $500. The online casino will give away $30,000 every week until June 1st and then there'll be a $1000 cash prize draw as players cross the finish line. "I think probably one thing race car drivers have in common with slots players is they both love excitement," said Intertops' casino manager. "I'd say spinning online slots is a whole lot safer though!" Intertops Casino, popular all over the world, rewards players with points. Every Monday they get bonuses based on those points. Complete contest details and current player rankings are avaiolable at http://casinopromotions.intertops.eu/speed. Win casino bonuses up to $500 each during $30,000 weekly casino bonus giveaway. If you're in the top twenty any week you'll be in the running for the $1000 Grand Prize awarded June 2nd. For more than thirty years, Intertops has been one of the most trusted online casinos. It has hundreds of casino games from Realtime Gaming and poker and sports betting.